Nintendo is hoping that "blue ocean" lightning strikes thrice with the October 20th release of Wii Music in North America, the rhythm game that, according to the company, "builds on that inclusive legacy" of Wii Sports and Wii Fit and translates into runaway sales. 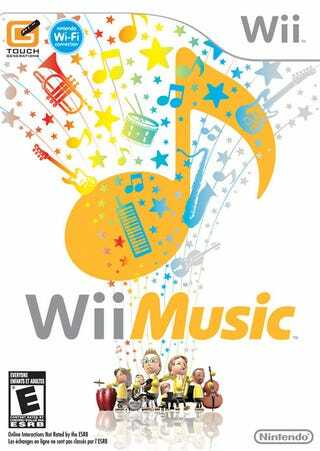 With more than 60 instruments, including guitar, drums, dog and cheerleader, and over 50 songs, Wii Music aims to bring music performance to the not-good-at-Guitar Hero masses. While the press release highlights the Wii Music elevator pitch, the newly updated product page gives us a look "Beyond the Jam." The playback mode lets you review your jam session with dramatic camera angles and the tone quiz "tests your musical ear by giving you challenges, like putting note-playing Miis in order from lowest to highest pitch." And how could we ever forget that Wii Music will let us drum in tandem with the Wii Balance Board? We could never forget, is the answer.